The Genii of the City | Steven J. Barela, LL.M., Ph.D.
An international lawyer should no longer write for rulers alone (who may or may not heed his words); he ought to write mainly for ordinary citizens: he should offer them parameters by which to judge international affairs, and analytical mechanisms for examining the intricacies of the world community. If society withdrew its obedience, the commander’s rule was at an end. Even Clausewitz, let us recall, was of this opinion, for he understood that military victories were useless unless the population of the vanquished army then obeyed the will of the victor. 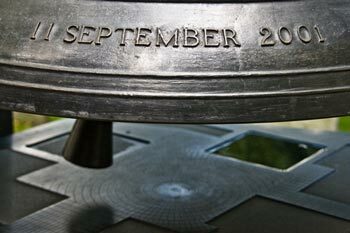 On September 11, 2001, the population of the United States of America began their day with news that four civilian aircraft had been commandeered to become deadly projectile weapons. The crashing of two of these airplanes into the World Trade Center in downtown Manhattan was caught on film and broadcast as the population sat in awe before their television sets watching the destruction of a national symbol. 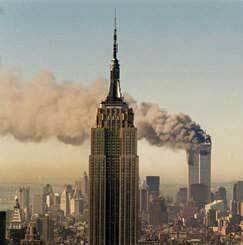 The spectacular terrorist event thus became a vivid image etched into the psyche of a nation. Using terrorism expert Brian Jenkins’ assessment that “terrorism is theatre”, we can see the event as theater par excellence. Working with the concept of terrorism as theater, one can begin to see that of all the tools implemented in orchestrating the tragedy of that day (including e.g. box cutters, airplanes, and skyscrapers), it was the television that proved to be the most strategic. The fact that the most destructive portion of the event was caught on film and repeatedly broadcast over the airwaves served Al-Qaeda’s overarching interests of destabilizing the US Government in the hope of jamming its operation. The reason that this shared potent image is so important is because it successfully drew the audience, specifically the American public, directly into the conflict as participants. The diffusion of the events of that day must simply be recognized as a part of the nature of US media and democracy, and these violent and destructive images brought a citizenry full of ire directly into the fold for the creation of counterterrorism policy. It is the reaction to these terrible events that will primarily concern us in this book. This is because terrorist groups involved in asymmetrical conflict are trying to shift the field of battle away from a conventional military encounter where they are clearly at an enormous disadvantage and instead use a “strategy of provocation” to further their goals. This baiting is a challenge which the victim state must carefully consider when crafting its counterterrorism policy since it has considerable hard power to wield should it choose to do so. Thus we will see the need for legitimacy to be placed at the center of the analysis of counterterrorism: policy that cannot be disentangled from the terrorism that provokes it. While it is rare that there is a completely coherent idea of what response their deeds will produce, a central motivation of those who employ terrorism is to incite some type of reaction from their government adversary. In this book, it will be the response of the “war on terror” that will drive our analysis and serve to provide the evidence of legitimacy as a target of terrorism. By more fully conceptualizing legitimacy and by analyzing the reaction to 9/11 through its lenses, this basic element of societal structure will become elucidated as an essential factor in such conflict. Thus we will see the need for legitimacy to be placed at the center of the analysis of counterterrorism: policy that cannot be disentangled from the terrorism that provokes it. There is no doubt that 9/11 was a violent attack on innocent civilians in flagrant transgression of the principles of humanitarian and human rights law that should be properly recognized and deplored. The “violation of established norms” is in fact one of the characteristic features of a terrorist act, and is a reason why it often triggers such a vehement and powerful response. Democracies tend to be particularly susceptible to such provocation since the spectacular nature of violent attacks makes good television coverage for a free press, a fact with which terrorist groups are familiar. Imagery and coverage of terrorist acts intensify panic and fear within the targeted society, which generally leads to an insistence upon clear and bold action to ensure security. The short democratic election cycle helps to foster a rapid and forceful response since politicians wish to be seen as attentive to security concerns. Yet it has been keenly pointed out that while “[s]peed and force are both critical elements in a successful military campaign; it is far less clear that they are necessary ingredients of a successful counterterrorism policy”. It is thus the tension created between bold and legitimate action that we will see played out in this book. Yet it has been keenly pointed out that while “[s]peed and force are both critical elements in a successful military campaign; it is far less clear that they are necessary ingredients of a successful counterterrorism policy”. One of the distinctive characteristics of this particular terrorist attack is that it was an act of cross-border violence. The reason why this feature of the strike is so crucial is that the counterterrorism response was thus inevitably subjected to the rules of international law to help assess its legitimacy. In this circumstance, international laws are the most clear and obvious standards available to citizens to judge the legitimate use of physical force by their governments. Along with the mass proliferation of media forms making the theater of terrorism much more dramatic, the twentieth century has also seen an exponential growth of international law. An important part of that expansion has been in rules protecting individuals from abuses by government. In this way a valuable metric has been developing by which citizens have become able to measure their government’s legitimate exercising of physical force, especially when it is done against or over foreign nationals. Because international humanitarian law and human rights treaties, along with the UN Charter, have framed the questions pertaining to the legal nature of the responses to these terrorist strikes (seen most clearly in internal government documents), international law will serve as the framework for this book. To classify this work it is also necessary to recall the intimate relationship between international law and diplomacy. Of course, it is commonly recognized that a diplomat “must be conversant with the principles of public international law” since they are directly within their scope of operation. As international obligations expressed through treaties represent the duties states recognize to one another, they provide the foundation for the language and communications used by the representatives of those states in their relations. Building on this premise, this book will work particularly with the concept of new diplomacy. Along with the mass proliferation of media forms making the theater of terrorism much more dramatic, the twentieth century has also seen an exponential growth of international law. In 2002, Harold Pachios, Chairman for the Advisory Commission for Public Diplomacy, gave a series of lectures for the US State Department discussing what he described as new diplomacy, and he saw it comprised of two primary components. In his speech he spoke of a renewed attention to diplomacy that was borne of the attacks of 9/11 and indicated this must be met with a renewed focus on public diplomacy. In other words, a greater effort should be made to explain the values and principles of the US to citizens in other countries. It had customarily been the case that exchanges between states were largely carried out behind closed doors and hidden from the public eye. However, in the second half of the twentieth century, this has changed dramatically with a move toward courting the general publics of other countries. Of course, this shift has tracked the major development of international organizations and the sweeping rise in multilateral treaties. Second, the conduct of international relations has been significantly altered by the Internet, which has given ordinary citizens instant access to news of government actions across borders, international conventions meant to govern those activities, and data analyzing compliance. This technology also brings with it the ability for individuals to connect and organize with like-minded people within their own country or across the globe. Thus, the second facet of this phenomenon discussed by Pachios was labeled as information age diplomacy. The piece that becomes particularly relevant in this book, and which is suggested as an important feature of new diplomacy, is that the Internet renders the division between domestic and foreign publics purely theoretical since both have access to the same freely available information. Pachios identifies these two elements of diplomacy, open and widely disseminated in today’s world, as central to defining new diplomacy, and they likewise construct the understanding here. Capturing extremely well the connection between international law and new diplomacy are the sentiments expressed by the renowned international jurist Antonio Cassese in the first epigraph to this introduction. Cassese’s contention that international lawyers must address common citizens and offer them methods and structures for analyzing the actions of states was germane two and a half decades ago, and is now all the more compelling in consideration of the expansive growth of information age and public diplomacy. In short, new diplomacy acts as a figurative conduit for the flow of international law to ordinary citizens. The specific tactics that will be analyzed in this book are detention, war-making, and interrogation, with a closing remark on drone killing. On the three primary issues, the policies of the “war on terror” reached beyond reasonable justification, no matter how well positioned the authorities were who drafted interpretation of the state’s legal duties. When aggressive policies were forced into the open and explanations were demanded by courts, international bodies or the public, we will find that they failed to meet the basic requirements of legality, morality, and efficacy. Counterterrorism policies overreached and did not succeed in meeting the codified obligations of domestic, international, and constitutional law, a moral standard of reciprocity, and an empirical criterion of effectiveness. These critical failures all came with a cost to the government’s legitimacy. By the end of his second term, President George W. Bush, whose signature policy was indeed this global war against terrorism, found himself embattled, beleaguered, and in what can be termed a “legitimacy deficit.” Because the mandate of the original architects of the “war on terror” has come to a close, our primary attention will be on these initial policies. Ample documentation exists in the public sphere and has been augmented by numerous leaks from concerned administration officials over the years. These leaks themselves indicate that a legitimacy deficit was suffered since such disclosures represent a lack of pull toward compliance with authority. Nonetheless, even though President Barack Obama was swept into office on a campaign emphasizing “change,” we find that some of his counterterrorism policies have not departed in a significant way from those of his predecessor. In a move that was meant to live up to this campaign promise, President Obama signed executive orders on his second full day in office indicating a noteworthy adjustment. Yet there has been continued legal struggle over detention policy and a failure to close the Guantánamo facility as promised. Additionally, there has been a shift in preferred tactics as detention and interrogation became severely questioned by both domestic and international audiences. 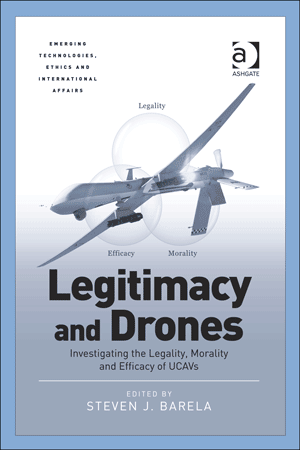 As such, the Obama policies and their diplomatic implications will be analyzed at the end of each related chapter, with a look at the drone program in the conclusion to the book (an extensive look through the lens of legitimacy is being carried out in the forthcoming book The Legitimacy of Drones). The noted scholar Martin Wight has described the 400 years of international theory leading up to the surge of its study in the twentieth century as a partition “between philosophically minded international lawyers and internationally minded political philosophers”. Distressingly, we will find that the historical research on imminence as the minimum trigger for the use of force will continue to be entirely relevant as the Obama administration has also chosen to redefine this indispensable standard for anticipatory action. If we consider that the diminished pull towards compliance primarily occurred in President Bush’s second term, it is an appropriate time to take note of some of the similar seeds of illegitimacy that have been put in place. Interdisciplinarity has been employed in this work in three distinctive manners. At the outset, on a conceptual level, this work represents a conscious integration of two primary disciplines: political philosophy and international law. Of course, this marriage is not novel. The noted scholar Martin Wight has described the 400 years of international theory leading up to the surge of its study in the twentieth century as a partition “between philosophically minded international lawyers and internationally minded political philosophers”. Thus, this work simply reaches back to this deep tradition and filiation of thought on international society to present a text that cannot be simply classified into today’s disciplinary categories. The intention behind using the intersection of these two disciplines is to formulate and investigate one specific impact of today’s changing international environment on the internal political climate of individual states. The dramatic increase in global cooperation throughout the twentieth century—between international organizations and their state missions of diplomats, foreign officers, international civil servants, intelligence officers, military personnel, police investigators, judges, legislators, and financial regulators—has had a bearing on the shape and content of the domestic political order. The rules that govern all of these interactions, and the diplomats engaged to monitor and advocate for compliance, have undergone a mushrooming development following the conclusion of each world war. This dramatic growth is arguably the most significant change the international system has experienced since the inception of the state-based system ushered in with the Peace of Westphalia in 1648. Here we explore its impact on domestic legitimacy. The reasoning for fixing our gaze on international legal obligations will be best illuminated through the discipline of political philosophy. Specifically, we will look at the question of what maintains an authority as legitimate. That is, what actually generates and preserves the will to obey the authority who has the power to command? To explore this question, we will next employ interdisciplinarity as a tool of construction. That is to say, various specialists on the question of legitimacy will be brought together from different fields to engage in an “interdisciplinary dialogue” to construct our theory applicable to political struggle involving state and non-state actors. This interchange will be used to erect the concept of legitimacy as a target, and it will bring us to one particular author whose work undergirds this study. It is hypothesized that each of these asymmetric methods places a target on the legitimacy of a government, even if the scope of this particular investigation will only encompass terrorism. In 1942 an Italian historian, Guglielmo Ferrero, wrote a valuable work of political philosophy entitled The Principles of Power in which he explores the subject of legitimacy. Ferrero cogently explains that a government is “legitimate if power is conferred and exercised according to principles and rules accepted without discussion by those who must obey”. He makes clear that the structure of every society is based on the intersection of command and obedience. Put another way, the authority in command at the top of a community must be bestowed with legitimacy through compliance from below. Without a convergence of these two elements any collection of people cannot act in concert or work together toward shared goals. 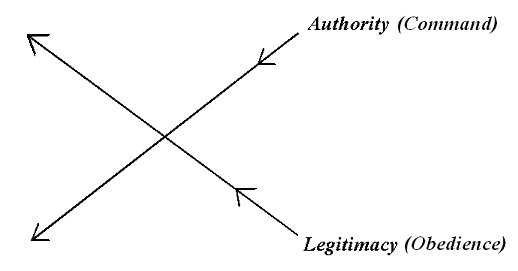 No doubt there has been significant attention on the top-down aspect of authority since it is much easier to identify, track, or even target. However, it is the elusive bottom-up component of legitimacy that will concern us here. The conventional military method of engaging in armed conflict has been to focus one’s forces on the enemy’s command structure and military to “disarm the enemy”. Yet this approach to and thinking about warfare has been shifting. Throughout the twentieth century there has been a particularly curious development in the line of attack concerning political conflict. During this century there was a conspicuous increase in the use of guerrilla warfare, nonviolent active resistance, and terrorism to attempt, sometimes successfully, to wrest power from an authority. Fittingly, the second epigraph here comes from an enormously valuable work by Jonathan Schell exploring these contemporary developments in warfare and highlights the imperative of obedience. One important element that each of these tactics have in common is that they are all means employed by non-state actors, even if the approach to the use of violence in each case differs significantly. It is hypothesized that each of these asymmetric methods places a target on the legitimacy of a government, even if the scope of this particular investigation will only encompass terrorism. Ferrero’s work also provides an appropriate title to this introduction. While he identifies an element of society that often goes unnoticed (the uncoerced pull toward compliance), what constructs this force is said to be unknowable. He labels the content of legitimacy “the Genii of the City” and proposes that, although this obedience is ever-present in all communities acting in concert, it is unseen and without shape. Ferrero explains, “[b]ecause they are invisible, men are too often apt to be unaware of their presence and even of their existence. And yet these invisible Genii rule our entire existence”. Despite this coy proposal that the content of legitimacy cannot be known, it is the intention of this work to expose the Genii of the City. While such a project must certainly be undertaken with humility, it is also one that is demanded by the logic pursued in naming legitimacy as a target. Despite this coy proposal that the content of legitimacy cannot be known, it is the intention of this work to expose the Genii of the City. 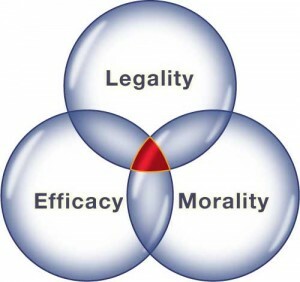 We will apply the three lenses of legitimacy sequentially, adding one lens at a time. By applying the lenses of legality, morality, and efficacy in this manner, the intention is multiple. First, by beginning with the lens of legality it will be possible to see clearly how these policies of the “war on terror” came into direct contact and conflict with the international legal obligations of the US. Next, the structure of our work will draw attention to the public aspect of new diplomacy in an information age, and this will demonstrate how international law became a direct part of the discussion about the legitimate exercise of physical force by the government. Finally, by adjoining each lens successively we will see the intersection and interplay between the three conceptual spheres. This represents the third facet of interdisciplinarity to be applied in this book. 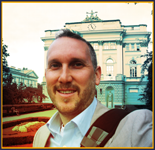 As each sphere or lens embodies a different approach to academic investigation (i.e. formal, axiological and empirical validity), the intention is to explore how they interact without devolving into an analytical mush in which each component becomes largely indistinguishable. “Rule 1. The parties to the conflict must at all times distinguish between civilians and combatants. Attacks may only be directed against combatants. Attacks must not be directed against civilians”. This standard is essential to the conduct of legitimate warfare, and there is no doubt that it becomes an extremely arduous and demanding task in the case of asymmetrical conflict. By implementing policies that are illegal, immoral, and ineffective, directly stemming from using suspicion to meet the challenging requirement of distinction, a government runs the risk of alienating its citizens and destabilizing the structure of its own society. To be sure, many who confront terrorism begin with the premise that one must focus on killing or vanquishing the enemy, or offensive strategy. That is not the intention here, nor is it believed to be the correct starting point. By identifying a target at which terrorists aim this book instead looks at defensive strategy. In doing so it promotes the building of resilience to deal with modern threats while not jeopardizing legitimacy. Thus, this investigation provides indications of where a society would want to fortify its defenses when facing an asymmetrical adversary using terrorism. 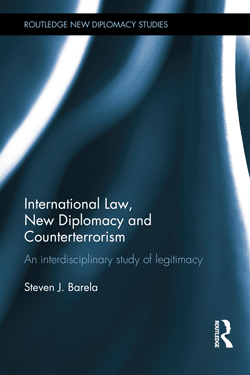 As a result, this work represents a view on the shifting impact of international law and new diplomacy that is worth noting, if only for crafting counterterrorism policy to better defend the target of legitimacy. Diplomats defending, or foreign diplomats confronting, overly aggressive policy find themselves under a growing pressure in the twenty-first century from citizens all over the world. Over the past six decades there has been a mass proliferation of international institutions and diplomatic personnel, along with nongovernmental organizations engaging them as representatives of an international civil society, all governed by international law. To suggest that this immense growth has not affected the domestic legal order or the mental framework for how citizens judge the obligations of their own government in an information age is to deny the obvious. The pertinent question is just how much change has come about, not whether any change has actually occurred. As a result, this work represents a view on the shifting impact of international law and new diplomacy that is worth noting, if only for crafting counterterrorism policy to better defend the target of legitimacy. JENKINS, B.M. ‘International Terrorism: A New Mode of Conflict’, in Carlton, D. and Schaerf, C. (eds. ), International Terrorism and World Security (London, Croom Helm, 1975) at 16. LAQUEUR, W., Terrorism (London, Weidenfeld and Nicolson, 1977) at 81. RICHARDSON, L., What Terrorists Want (New York, Random House, 2006) at 101. CHATTERJEE, C. International Law and Diplomacy, (London, Routledge, 2007) at xxi. PACHIOS, H. “The New Diplomacy,” Remarks to Woodrow Wilson School of Public and International Affairs, Princeton University, Princeton, NJ, (April 24, 2002). WIGHT, M., International Theory: The Three Traditions (New York, Holmes & Meier, 1992) at 3. FERRERO, G., The Principles of Power (New York, G.P.Putnam’s Sons, 1942) at 135. CLAUSEWITZ, K., ‘On War’ in The Book of War (New York, The Modern Library, 2000) at 266-7. SCHELL, The Unconquerable World. This is an enormously valuable work exploring these contemporary developments in warfare. This book from the recently departed Schell in March 2014 has been extremely influential on mycontemplation of this subject. Schell begins by delving into the work of the well-known Prussian general and military philosopher Karl von Clausewitz to shed light on the ultimate end and objectives of war: i.e. “[w]ar is thus an act to compel our adversary to do our will.” (Idem, at 264). Using this as his point of departure, he then takes the reader through the logic and reasoning behind nuclear deterrence, people’s war and non-violent resistance movements. Primarily known for his work on nuclear weapons and disarmament, Schell is well positioned to discuss the philosophical questions that lie beneath the use of force between states, guerilla war, terrorism or even non-violent action. He lucidly explains that all of these actions share the same intent. The intention of this work is to bring legitimacy to the center of this discussion so as to further conceptualize what Schell has already valuably initiated. FERRERO, G., The Principles of Power (New York, G.P.Putnam’s Sons, 1942) at 17. HENCKERTS, J., and DOSWALD-BECK, L., Customary International Humanitarian Law, International Committee of the Red Cross, Vol. I, (Cambridge, Cambridge University Press, 2005) at 3.